A remarkable polemic map on the back of a 1922 electric bill! The Los Angeles aqueduct - world's longest at the time - was completed in 1913 by the legendary superintendent William Mulholland. http://www.history.com/topics/los-angeles-aqueduct, accessed March 20, 2016. The aqueduct brought ample water from the Owens Valley on the Eastern side of the Sierra Nevada mountains, not only for the massive growth of the city, but for the San Fernando Valley as well. 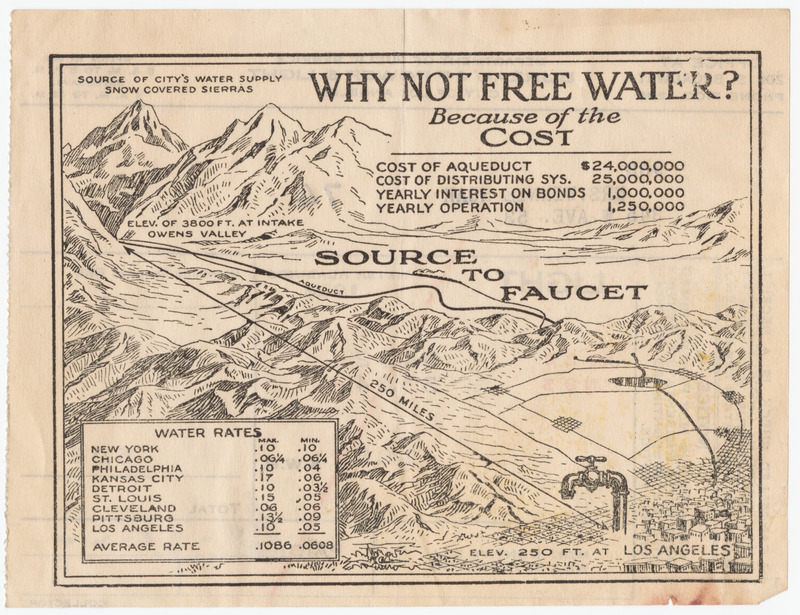 The map identifies the "source of the City's water supply" at an elevation of 3800 feet in the "snow covered Sierras" and shows a bird's-eye view of the 250-mile course of the aqueduct "to faucet" in Los Angeles.